People here in Anaheim, California celebrate Halloween in a rather unique way— with a parade! 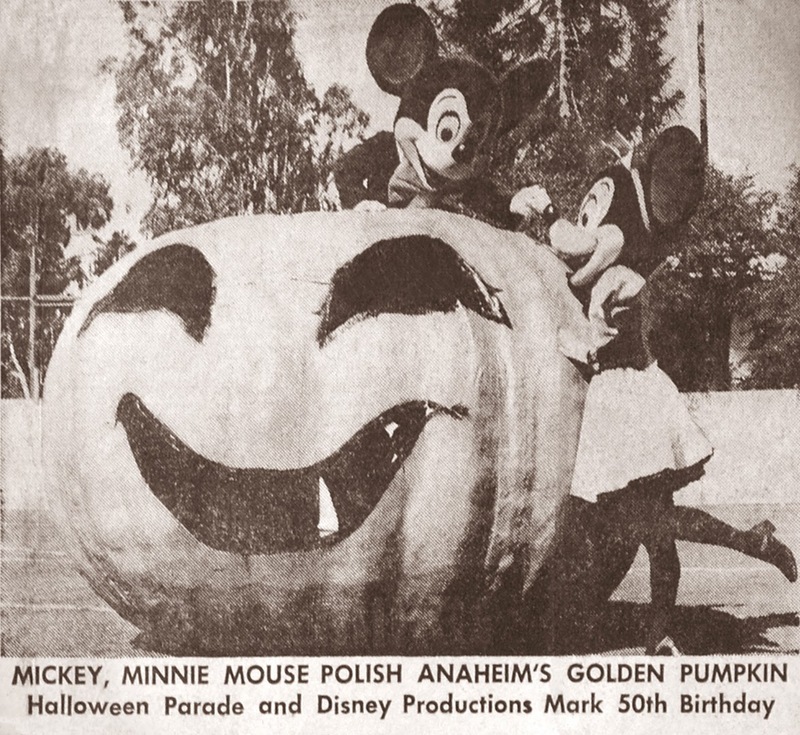 The nighttime pageant of ghosts, goblins, jack-o-lanterns and witches stretching a mile through Anaheim’s darkened downtown has been a family-fun tradition for almost 90 years. 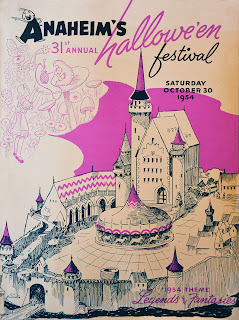 And, as you might imagine, Disney has played a role in the festivities ever since Disneyland moved into town…and even longer than that! 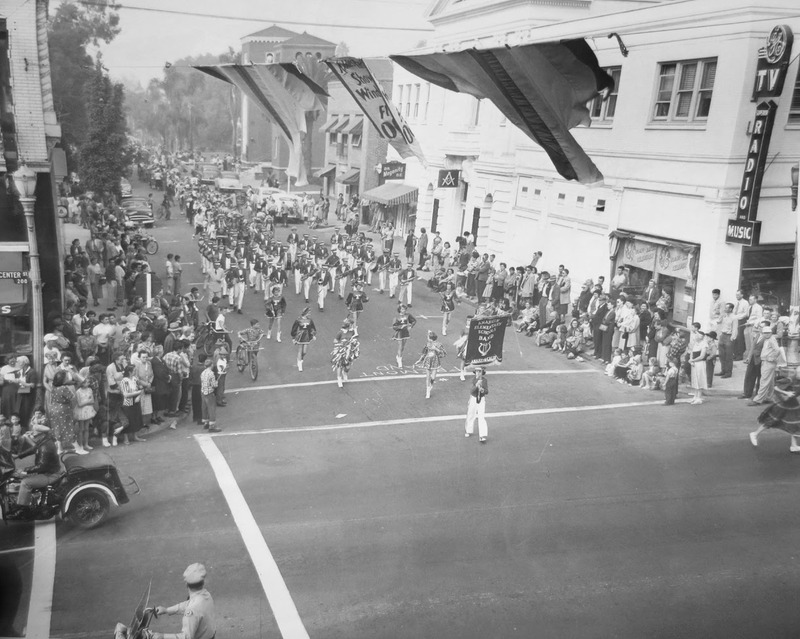 A source of city pride, the parade is part of the larger and older Anaheim Fall Festival put on every year by Anaheim businesses, schools, organizations, and residents. For one exuberant October night, the most populated city in Orange County takes on the atmosphere of a small town. 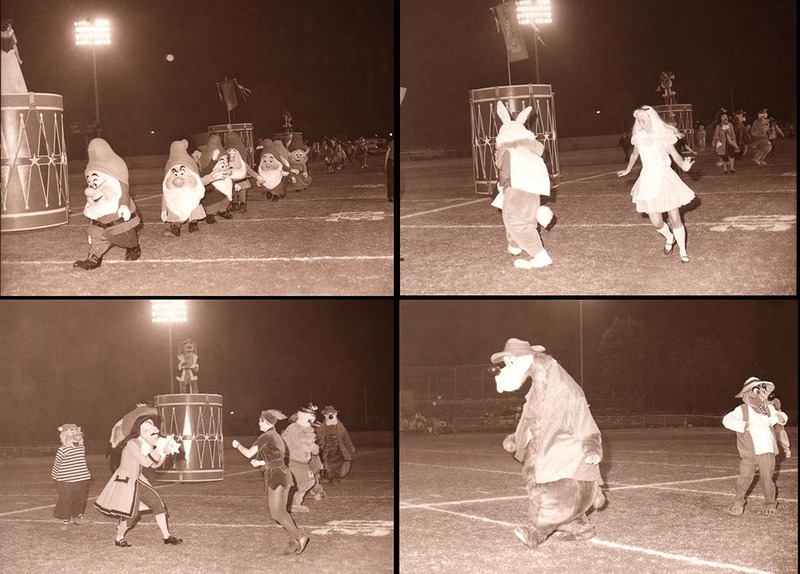 Long before “trick-or-treating” became the huge thing that it is today (since the 1930s), Halloween was typically a time for mischief and pranks by neighborhood youngsters. In the tranquil little farming community of Anaheim, soaped windows, uprooted fences, and damaged property were turning “All Hallow’s Eve” into a major headache for residents and businesses. 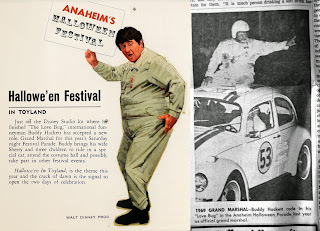 To steer the energies of Anaheim kiddies toward “wholesome fun and frolic,” a “Halloween Carnival and Festival” with games and costume contests was devised by local merchants in 1923. 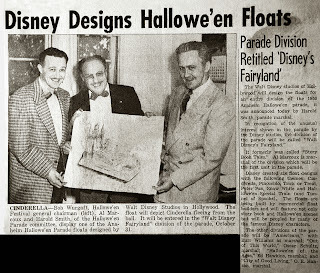 Incredibly, this solution did the trick, and the following year a nighttime Halloween Parade was added to the Festival activities. 20,000 residents and neighbors from nearby towns crowded onto the sidewalks on both sides of the street on October 31, 1924 to watch the 45-minute procession led by baseball superstars Babe Ruth and Walter Johnson who served as the first Grand Marshals. 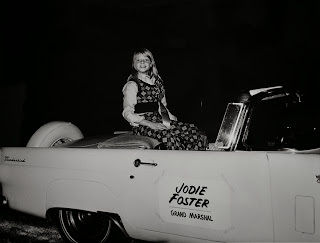 Fast-forward to the 1950s, and the Festival with its wildly popular parade has grown to enormous proportions. The Los Angeles Times called it the “biggest Halloween party in the nation” with over 75,000 spectators lining the parade route. Earne Moeller of the Anaheim Chamber of Commerce began exploring ways to attract some serious attention to the Festival by reaching out to Los Angeles industries as possible parade sponsors. 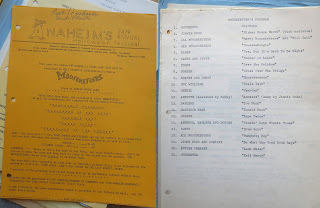 One of the organizations that received an invitation from Anaheim was the Walt Disney Studios. 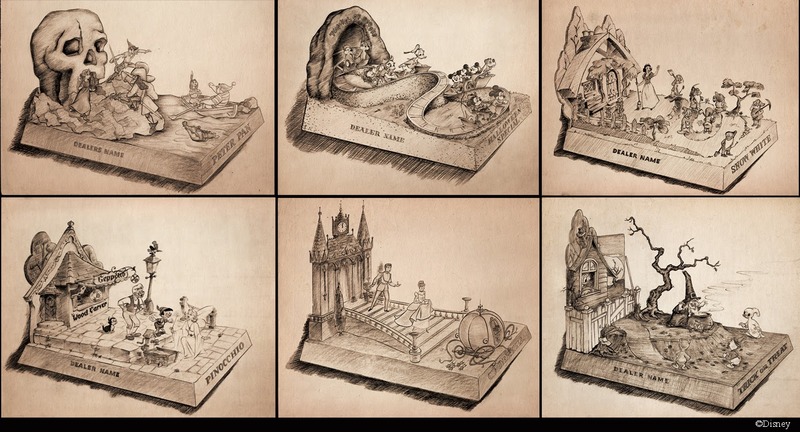 Comparing the concept art with the few existing photographs showing the finished floats, it’s important to keep in mind that Disneyland hadn’t even been built yet, and it was up to the local residents who performed on the floats to provide their own home-made costumes of the famous Disney characters. 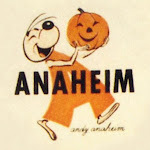 It may have been a tad hit-and-miss, but it’s a sure bet that Disney made a spectacular first impression upon Anaheim. First Disney character as Grand Marshal, accompanied by his voice. 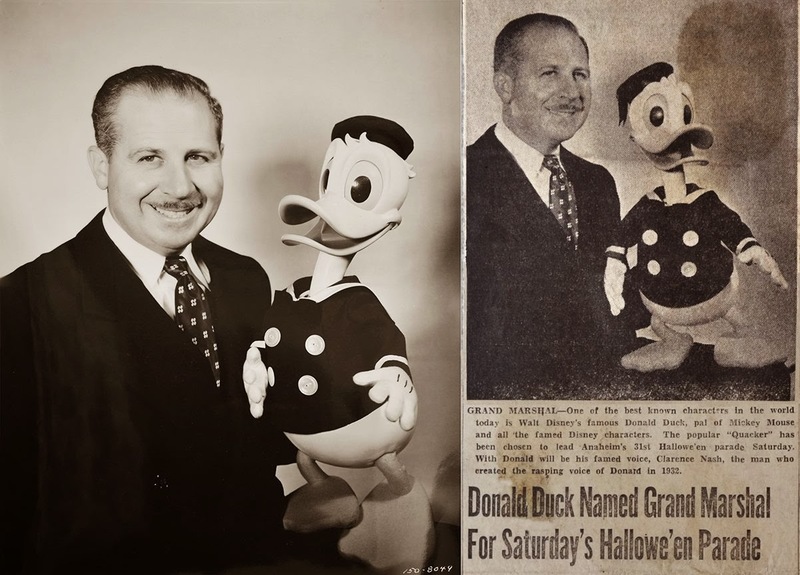 The next year was even better, with Donald Duck himself as Grand Marshal, leading the parade (accompanied by his voice, Clarence “Ducky” Nash). 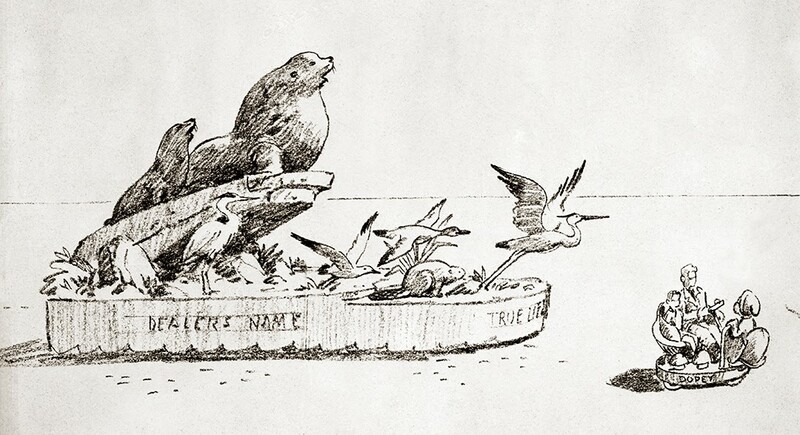 An entire segment of the spectacle was dedicated to “Disneyland”-- now that the cat was finally out of the bag -- with marvelous float concepts drawn up by Disney artist Yale Gracey, who years later would go on to conjure the Haunted Mansion attraction’s most chilling, thrilling illusions. 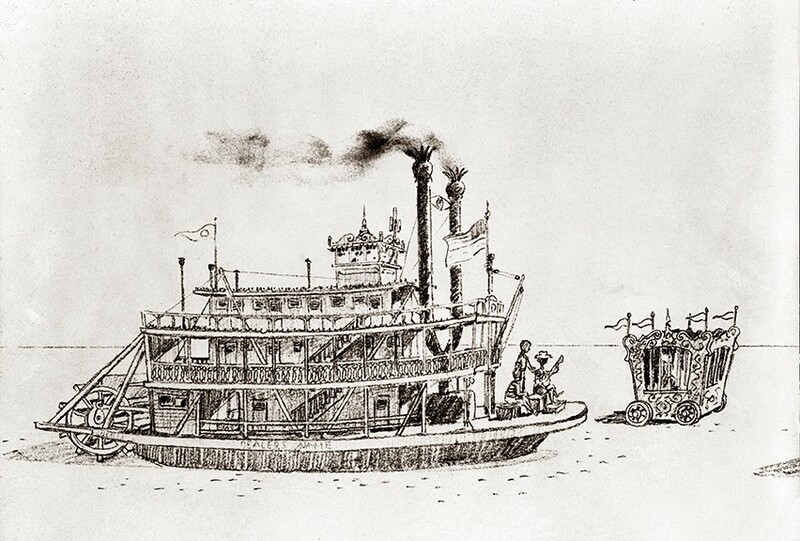 Sketches show a parade-sized Sleeping Beauty Castle, Mark Twain Riverboat, the Casey Jr. 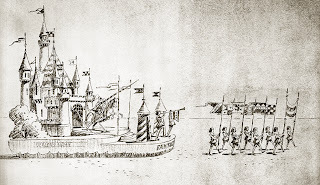 Circus Train, and a sleek prototype Tomorrowland rocket; possibly the first three-dimensional preview of Disneyland’s delights to be seen by the public. 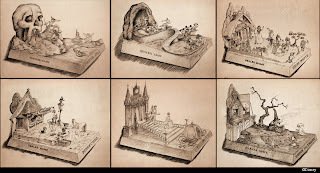 1954 float concepts by Yale Gracey and Phyllis Williams. 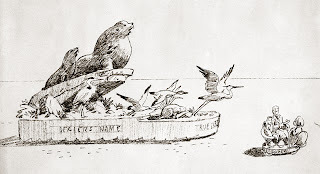 Most notable is the float representing “True-Life Adventureland”-- an area originally planned for the Park that would have been themed to Walt Disney’s Oscar®-winning series of nature films. 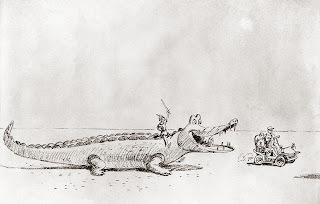 The float was never built, as the concept rapidly evolved into the tropical Adventureland familiar to us today. 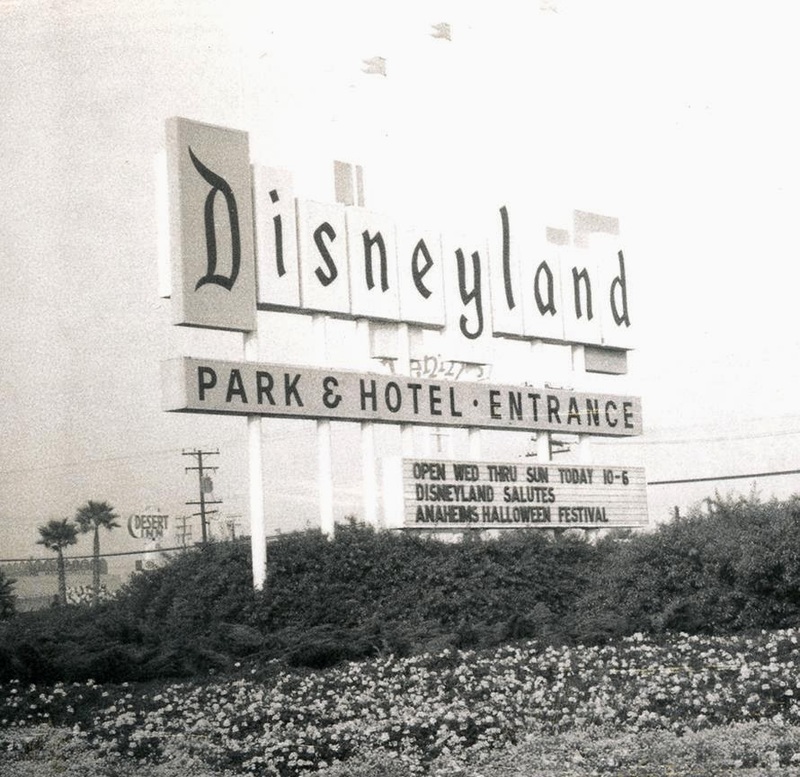 Disneyland welcomed the world into its fabulous realms on July 17th, 1955, and Anaheim welcomed its newest neighbor with special prominence in the Halloween Festival. The Disneyland Band, led by Vesey Walker, opened the Disneyland section, followed by the Park’s horse-drawn Mickey Mouse Club Circus Wagon carrying Jimmie Dodd and the Mouseketeers, making their first public appearance outside of Disneyland. Nearly 150,000 people came to watch the parade that year, with Buddy Ebsen, (Davy Crockett’s television sidekick, Georgie Russell) honored as Grand Marshal. Disney continued to bestow its own special Halloween magic on Anaheim over the years in surprising ways. 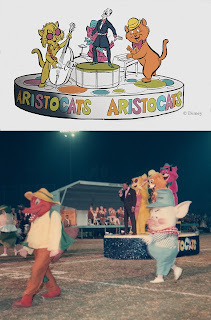 In the 1950s, the original Mouseketeers appeared at a special parade pre-show, featuring a ballet performance by Annette. The original Golden Horseshoe Revue - complete with can-can girls - was performed one Halloween in Anaheim’s Pearson Park, with cast members Betty Taylor, Donald Novis and Wally Boag. 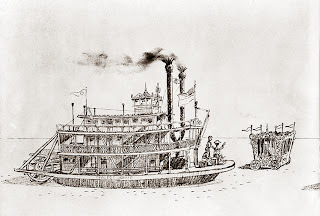 Disneyland’s unique fleet of Main Street Vehicles have all driven “outside the berm” to join the parade, including the Omnibus, fire wagon, horseless carriages and Walt Disney’s very own “Runabout” car. 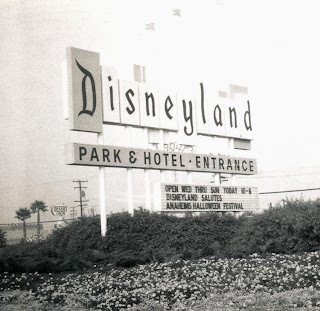 Even various Main Street Electrical Parade units have been known to disappear from the Park for an evening’s spin through downtown Anaheim. 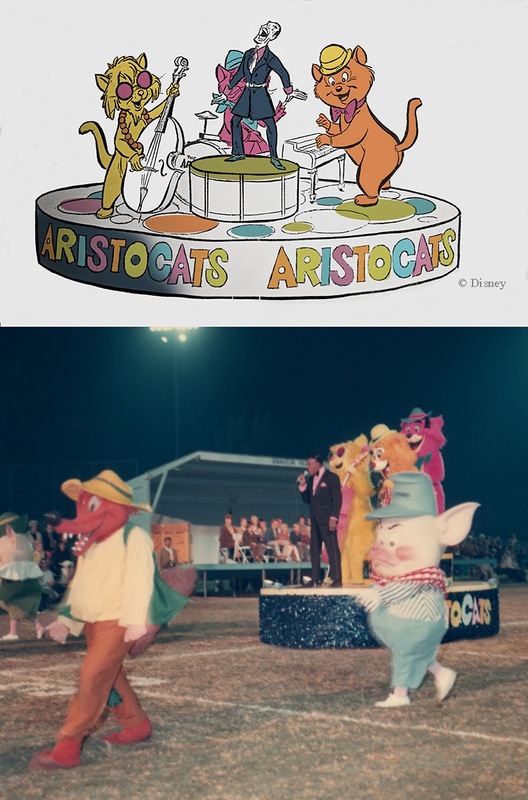 1970's Halloween Parade featured the great Scatman Crothers with the Aristocats. In 1973, Walt Disney Productions and the Anaheim Halloween Festival celebrated their shared golden anniversaries with a “Fifty Happy Years” cavalcade of thirty-one familiar Disney characters dancing atop six giant drum floats. 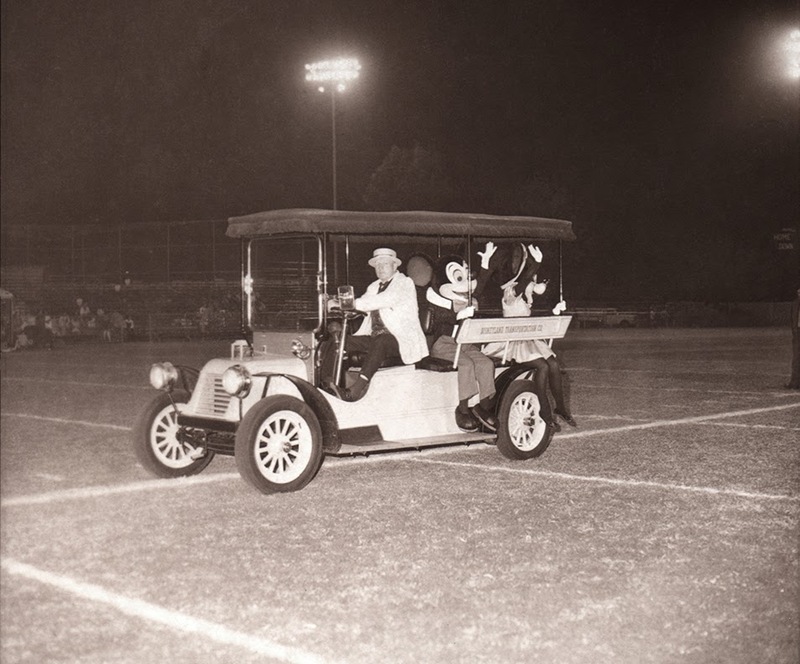 Naturally, Mickey and Minnie were the star attractions traveling through the streets of downtown Anaheim in one of Disneyland's own "horseless carriages" from Main Street U.S.A. 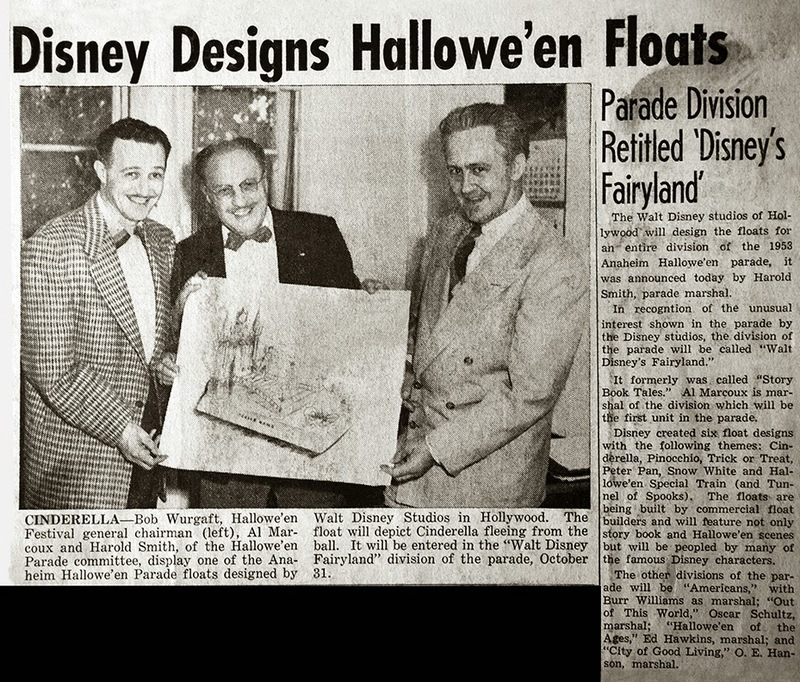 It was Disney's biggest involvement in the Halloween Parade's history - before or since! 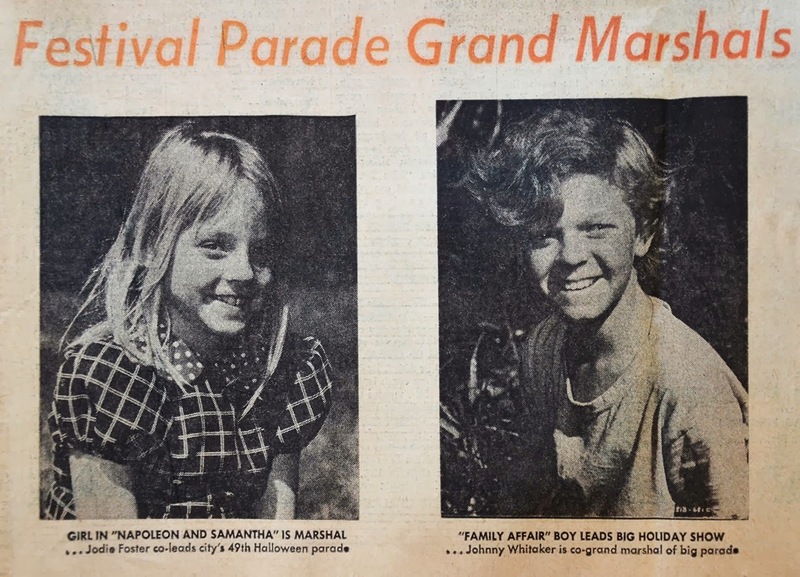 Real-life Disney film stars-turned Grand Marshals have included The Love Bug’s Buddy Hackett and a very young Jodie Foster with her Napoleon and Samantha co-star Johnny Whitaker! The 2013 Anaheim Halloween Parade stepped off this past Saturday evening at dusk. As the sun began to set, Disneyland's latest entry - Minnie Mouse in a lovely horse-drawn carriage - made its way down the long stretch of Broadway past over 45,000 spectators. 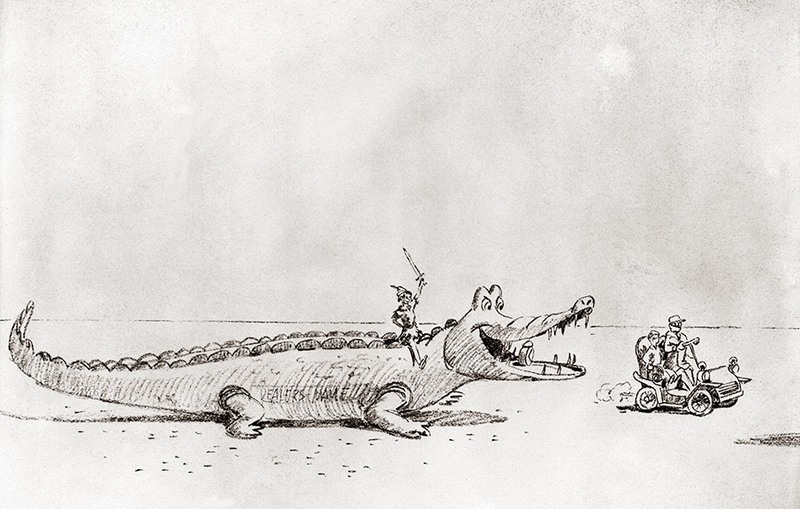 Re-discovered by a new generation, the parade continues to radiate old-fashioned charm, and crackle with small town magic!